Specializing in post-war and contemporary art, Casterline|Goodman Gallery shows blue-chip original artworks from the 20th and 21st centuries, including original paintings, sculptures and drawings by established artists such as Jean-Michel Basquiat, Ed Ruscha, and Andy Warhol. Casterline|Goodman Gallery operates in Aspen, CO and Nantucket, MA. This winter, from December 4thto December 9th, Casterline|Goodman Gallery will exhibit at Art Miami. The gallery will feature a selection from our most prominent artists, including Mark Bradford, Jim Dine and Richard Serra. Mark Bradford is a contemporary American artist known for grid-like abstract paintings combining collage with paint. Born in 1961 in Los Angeles, Bradford studied at the California Institute of the Arts receiving his BFA in 1995 and his MFA is 1997. His artistic influence appeared at a young age, while helping at his mother’s hair salon. Even today, many materials such as dye and foil are used in his works. The majority of his work consists of issues dealing with race, gender and class. His work consists of many mediums including video, installations, collaged paintings and sculptures. Jim Dine is one of the few original Pop artists still working today. He is best known for his vibrant images of hearts, palettes, robes and Pinocchio. Dine moved to New York upon receiving a B.F.A. from Ohio University in 1957. He quickly became active in the local art scene through his involvement with artists Claes Oldenburg and Allan Kaprow and musician John Cage in exhibiting “Happenings,” performance art that was popular in the late 1950s and early 1960s. Dine’s work was included in one of the first Pop Art shows in America, New Painting of Common Objects, which was held at the Norton Simon Museum in California and featured other Modern artists as Andy Warhol, Ed Ruscha and Roy Lichtenstein. Richard Serra is an American minimalist sculptor known for his sheet metal installations. He earned his B.A. from University of California, Santa Barbara in 1961 and his M.F.A. from Yale University School of Art and Architecture in 1964. Serra was inspired by the teachers and artists that he met at Yale, most notably Philip Guston and Chuck Close. He was also influenced by his work in steel mills as a teenager and his father’s job as a pipe-fitter. 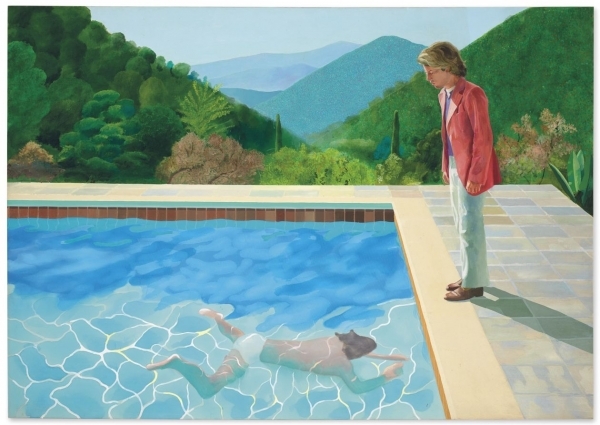 A David Hockney painting of a man in a pink jacket overlooking a sun-dappled swimming pool sold for $90.3 million at Christie’s in New York on Thursday—setting a record for a living artist at auction.